Karl enjoyed playing-cards as a child, having seen different designs from ltaly, Yugoslavia and Spain. Later he also enjoyed experimenting with design and production of playing cards. “Lettische Patience No.34” is inspired by “Latvian Red Cross Cards No.7” designed by Arturs Duburs and published in 1941 to commemorate the emergence of Latvia as an independent country. 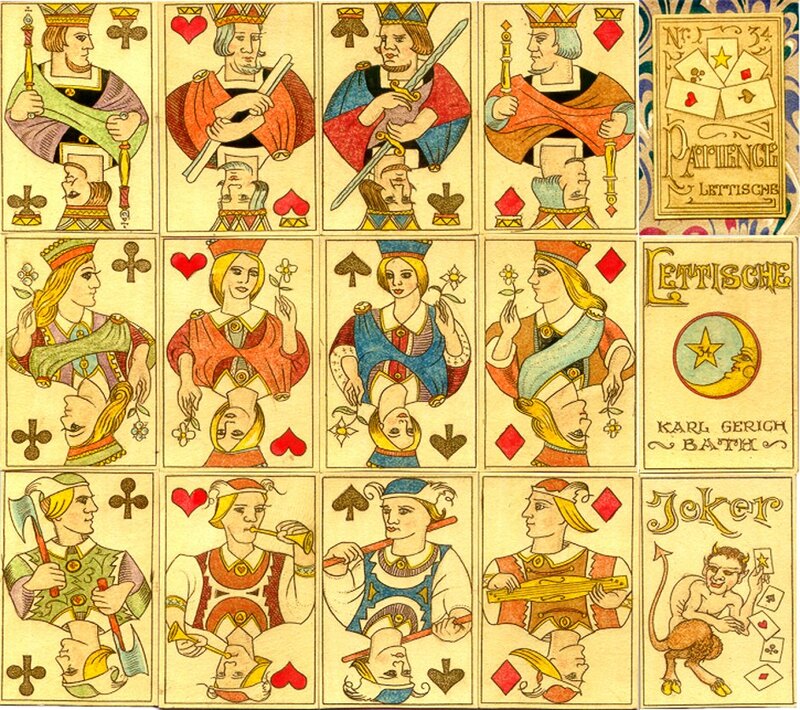 Karl's new, patience-sized version was published in 1994 as a 32-card pack with one joker. The double-ended courts are, by Gerich's standards, plain with simple costume designs based on the designs of Arturs Duburs. The joker shows a crouching satyr which is Karl's own design. There is also an extra title card with Karl's 'Moon/Star' motif, plus a card for the box top. Above: cards from Karl Gerich's Lettische Patience playing cards No.34 inspired by Latvian Red Cross Cards No.7. Total production is around 20 packs. Cards measure 36mm x 55mm. Images courtesy Barney Townshend.